Below are comments about Jack21096's artwork that have been left by teachers, family or other website visitors. Nice job Jack! Again I love the color choices especially Noah's favorite blue!!! Oh my gosh, Jack, this is fabulous and sweet that you used Noah for your artwork. You are a great artist but an even better big brother! Great job Jack! So proud of all the amazing artwork you did this school year so congratulations second grader, love you! WOW, Jack, your artwork keeps getting better and better with each new piece! So proud of you and your great accomplishments in 1st grade this year! Your artwork always put a big smile on my face. Loved this when you brought it home from school today! The colors are perfect for framing and hanging in the living room. Good job Jack!!! Another beautiful expression of your artistic talent! Way to go, Jack!!!!! A beautiful heart in such pretty colors just in time for Valentine's Day! Great job! Beautiful blue heart Jack and love the splash of gold. Good job! Excellent artwork! I'm so proud of you, Jack!!! Beautiful shapes and colors! Keep up with your artistic talents! Love these silly faces with the different expressions! Your artwork always makes me smile! Pizza, pizza.....who doesn't love it? We love your artwork, Jack! Always quite creative! 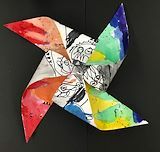 Loved this pinwheel when you brought it home from school today & now it's featured on Artsonia! Great job Jack! WOW, very nice, Jack! You should make some for your front yard. Keep up the excellent artwork. We love seeing all of your creations. Another cute picture from a great artist! 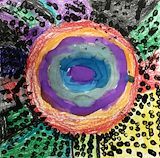 So happy to see that Jack's artwork is being displayed again this year on Artsonia! You've done a beautiful job with this artwork Jack! I love the choice of colors & "dots" surrounding the swirl of colors! Another beautiful piece of art! Grandpa and I love your fish! Oh Jack, once again you've impressed me with your artistic talent! When papa and I saw this we agreed you've captured the unique Dr. Seuss illustrations in the books. SO proud of you especially because I'm assuming this is the picture that will hang in the Mentor Superintendents office for the month? Love you!!! Awe Jack! Your artwork continues to amaze me. You always seem to choose perfect color combinations and these beautiful flowers even show depth in the middle of the blooms! Meena is sooooo proud of YOU! Grandpa and I really like this picture you made of Uncle Boo! I'm sure Uncle Boo is happy you thought of him in your school day and artwork. I think this is one of your best works of art, Jack! You are very creative. Aunt T is very proud of you!! Jack, you've done a beautiful job with this artwork! Hope mommy frames this one! Jack, mommy LOVES this one!! The colors are beautiful!! Jack, what a great self-portrait you drew. You are quite handsome, but we already knew that! Love the creative use of color and patterns in this artwork Jack! So proud of you!!! I think this is my absolute FAVORITE of your kindergarten artworks, Jack! BEAUTIFUL job! You are very talented in many ways. Papa and meena LOVE your new fish artwork full of beautiful colors! You are so talented and we are so proud of you Jack! Grandpa and I love your fish artwork! Very colorful. Hoping some day you will go fishing with grandpa and your dad on the boat and catch a real fish! Wow Jack!! I really like this painting of the sunset. You're a GREAT artist :) Keep up the good work. Love, Aunt T.
I just LOVE this picture Jack! It reminds me of windmills against a beautiful sky. Nice work! Wow Jack!!! You are a GREAT artist. I really like the colors and shapes you chose for this artwork. So creative! Keep up the good work habibi :) Love, Aunt T.
You did a great job with your shapes artwork Jack! Outlining circle and triangle and making the rectangle a present!